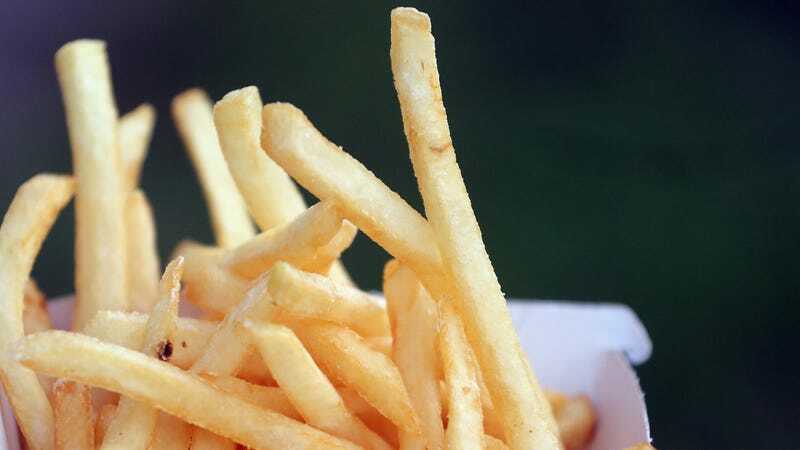 Should vegetarians assume they can eat French fries? French fries are the vegetarian’s last resort. When all the sandwiches on a menu contain meat and even the side of Brussels sprouts is fried in bacon, trusty fries are there like a port in a storm. Unless they’re fried in beef tallow. On Friday, a New York judge dismissed a class-action lawsuit against Buffalo Wild Wings that claimed damages stemming from vegetarians’ consumption of the chain’s fries. The suit alleged B-Dubs failed to disclose that its fries are crisped in beef tallow, rendering them non-vegetarian. Whatever the case’s legal merits or lack thereof, the suit led to an engaging discussion around my house this morning. But do vegetarians have to ask each restaurant which oil or fat is used for frying? Do they assume it’s non-animal-based? When they ask this, do servers actually know the answer? I suppose this depends on how steadfast a vegetarian one is. If you were fairly lax about it, and a server told you that of course the fries were vegetarian, would you chance eating fries crisped in beef fat? Or would you avoid risking it and just order the hummus plate again? Please discuss in the comments, and thanks for tuning in to this week’s edition of Meat Eaters Asking Basic Vegetarian Questions.